“Herbal Therapy”, “Diet Therapy”, “Aromatherapy”, “Supplements” expert modules – formulas have been optimized, read below for details. ​VedaNews section simplifies access to the news and articles from the developers of VedaPulse™, which can be read in the software window without the need to open them in a browser (this feature is only available with active Internet connection). Besides, VedaNews tab allows registering for the oncoming seminars on pulse analysis without leaving the software. Just click on the desired event banner, browse through its program and register! Nearest event – seminar and hands-on workshop at 21st Maharishi Ayurveda&Psychology Conference in Fairfield, Iowa, USA on April 29, 2017. This year, our educational project became independent. VedaEducation project is an international platform for online education of the specialists from the field of traditional medicine and CAM. We organize courses from the leading experts in the field of traditional medicine of Russia and whole world. For the ease of convenience, we have added announcements for the oncoming webinars and courses in the software. Now you will always know how and where to get additional education. This course is given by the world-renowned expert Dr. Ram Manohar (India).To learn more, click on the name of the course. Without leaving the software window, you can learn full information about the course and sign up for it. 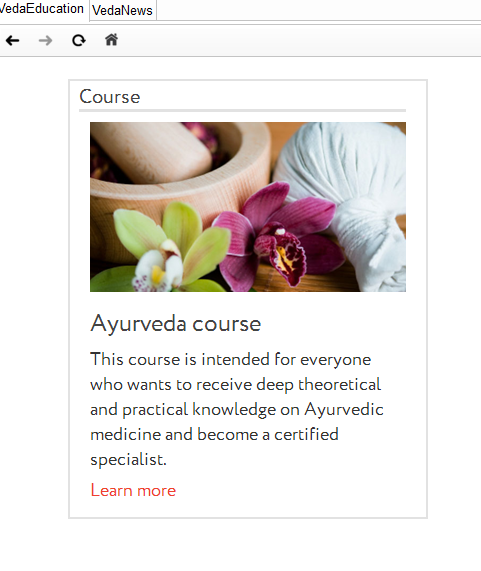 From this example of the Advanced course on Ayurveda (starts in the end of May 2017) we can find out that the course starts in the end of May, its full program, details about the expert and how this course can help your practice. Sign up for the course now – click to sign up! Our project will launch the website very soon. Welcome to the world of traditional medicine with VedaEducation project! An error associated with the inability to launch the updated expert module “Organ pulse” (with the subscription) without active Internet connection has been corrected. Read more about the details of the new “Organ pulse” expert module in the news about its release. ​“Telemetry” module has been updated. Now you have an ability to send several assessments from VedaPulse™ Home to VedaPulse™ Professional (or Professional to Professional in the Conсilium mode) at the same time. Algorithms of the list ranging have been updated. Now the software distinguishes TriDosha condition (all three Doshas in the normal state) and Dosha Kshaya (Dosha depletion, Dosha excess). The lists now take into account combination of Doshas for even more precise recommendations. Download VedaPulse™ software upgrade to start using new features. Leading developer of VedaPulse™ is honored with a highest award – Veda Brahma!